In a major blow to Indian hockey, Terry Walsh relinquished the post of the head coach of the national team after Hockey India (HI) and the Sports Authority of India (SAI) failed to convince him to take his resignation back, on Tuesday. An emergency meeting of the BCCI Working Committee here Tuesday decided to support Indian Premier League (IPL) chief operating officer Sundar Raman while postponing the board's Annual General Meeting (AGM) for December 17. Viswanathan Anand did not get much out of his prepared variation and had to settle for a draw in the eighth round to remain a point behind in the World Chess Championship match against Magnus Carlsen here today. New Zealand's batting tail wagged to take them to 403 in their first innings before they returned to dismiss Pakistan's openers on the second day of the second Test in Dubai on Tuesday. Veterans Virender Sehwag and Gautam Gambhir’s prospects of making an India comeback are all but over as the celebrated opening duo stayed away from selection in the 15-member North Zone squad for the Deodhar Trophy. The team will be led by off-spinner Harbhajan Singh. For the first time Indian cricket legend Sunil Gavaskar has hit out at Gurunath Meiyyapan, son-in-law of ICC president N Srinivasan, over his involvement in betting and also questioned the Tamil Nadu strongman's silence in the whole spot-fixing and betting issue. Impressive wins by world No. 6 Agnieszka Radwanska and seasoned Marcos Baghdatis paved the way for Pune Marathas’s close victory over Hyderabad Aces in the Champions Tennis League (CTL) here tonight. Champions Tennis League promises to be an action-packed affair, with the biggest tennis stars, including Martina Hingis, Venus Williams, Jelena Jankovic and Juan Carlos Ferroro, coming to India. Luis Garcia fired in a stunning header in the second-half to help Atletico de Kolkata end their four-match winless run by registering a 1-0 win over NorthEast United FC in their return leg ISL fixture at the Vivekananda Yuva Bharati Krirangan here today. Mohali-based cricketer Shubhman Gill has been adjudged the best under-16 cricketer of 2013-14 by the BCCI. The award comes after prolific runscoring by the right hand opener in the age group competition. Jammu and Kashmir’s Parvez Rasool was chosen as the best all-rounder for his performance in the 2013-14 Ranji Trophy by the BCCI. The Bijbehera player scored 663 runs and took 27 wickets from nine Ranji matches. He will be given the Lala Amarnath Award and Rs 2.5 Lakh. Qatar’s emergence as a global sporting hub gained further clout when Doha was chosen as host city for the 2019 IAAF World Athletics Championships on Tuesday. The fast-growing city alongside the Arabian Gulf will become the first from the Middle East to stage the blue riband event. Walsh, who had submitted his resignation on October 21 and whose contract was to expire on Wednesday, decided to fly back to Australia immediately without withdrawing his resignation, despite the intervention of the Sports Ministry which tried to persuade him to stay on. $176,000 during his stint with the USA Hockey. 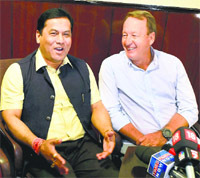 That statement had a damaging effect as Walsh categorically told Sports Minister Sarbananda Sonowal that he wouldn't be able to travel with the team to Bhubaneswar for the next month's Champions Trophy. The Ministry had acceded to most of the demands put forth by Walsh, even offering him a contract till the 2020 Olympics, but the 60-year-old Australian insisted on taking a “long break”, citing the “disturbing state of mind” he was in. Walsh talked about the suffocating environment in the federation, especially the high-handedness of Hockey India president Narinder Batra and interference by other officials. During his interaction with the Minister, Walsh complained about the allegations levelled by Batra, saying it had caused irrevocable damage. “Walsh was adamant about going on a break. He told the Minister that he was in a disturbed frame of mind and he wouldn't be able to coach the team for the Champions Trophy. He even refused to accept the contract offered to him till the 2020 Olympics, and insisted on taking a long break,” a Ministry official told The Tribune. Later, at a press conference, Walsh said that he was still optimistic about coaching the Indian team and a fresh proposal would be sent to him in the next couple of days by HI for his consideration, leaving the door still open for his return to India. “As on Monday, I have ceased to be a part of the national programme. We had reached an impasse regarding my involvement with the programme. But, there may be a way forward. I am still hoping for resolution in the near future. I need a few days to gather my thoughts. I shall return to my home, Perth, on Wednesday,” Walsh said. “There has been a proposal from HI which I am waiting to see. When that document comes to me, I'll have a look at it and decide about it in a couple of days. I believe if I don't take a break at this point, I wouldn't be of any use to the team. It's been quite difficult for me,” he added. November 2013 Succeeds compatriot Michael Nobbs as head coach of the Indian team. Hired till the 2016 Olympics. January 2014 His first big tournament as coach — Hockey World League Final in New Delhi. Team finishes sixth in the eight-team event. June The team finishes a lowly ninth at the World Cup in The Hague, Netherlands. Despite its mental frailties team shows all-round progress. July-August India wins first medal under him — silver at the Glasgow Commonwealth Games after losing to Australia in final. The comeback-win over New Zealand in the semifinals raises hopes of a medal at the Asian Games. September-October Leads India to their first gold medal at the Asian Games since 1998. Beat Pakistan in the final to qualify for the Rio Olympics. October 19 Walsh puts in his papers, one month before his contract expires. Wants more decision-making powers and more time with family in Australia. Reportedly asks for 120 days of paid leave, during which he would keep in touch with the team through video conferencing. November 9 During his one-month long notice period, India beat world champions Australia 3-1 in an away Test series. November 13 Sports Ministry appoints six-member panel to look into Walsh's demands. November 18 Quits formally after contractual talks with Hockey India and the Sports Authority of India break down. But a fresh proposal is still being worked out for the Australian's consideration. The meeting also supported exiled president N Srinivasan saying the allegations against him were baseless and aimed at destabilising the organisation. Made public Monday, the report of the Supreme Court-appointed Mukul Mudgal Committee probing the 2013 IPL spot-fixing and betting scandal cleared Srinivasan on two counts — the committee didn't found him involved in match fixing, nor was he found guilty of attempting to scuttle the probe into the fixing scandal. However, the report said he and four other BCCI officials, though aware that Individual 3 (a player whose name has not been disclosed) was violating the players' code of conduct, failed to take any action against him. The report had stated that Raman had been in touch with a bookie and had admitted that he was aware of Gurunath Meiyappan and Raj Kundra's involvement in betting, but did nothing about it. Meiyappan is the son-in-law of Srinivasan and an official of IPL franchise Chennai Super Kings while Kundra is a co-owner of another team, Rajasthan Royals. 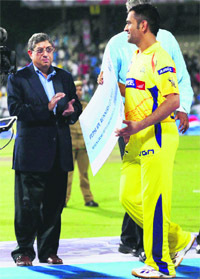 However, the BCCI decided to support the tainted IPL boss. “Sundar Raman gave his explanation relating to his role with reference to the conclusions relating to him in the report of the Mudgal Committee. The members heard his explanation and decided that the Board should support him to represent himself before the Supreme Court,” Patel said. Patel also added that the Working Committee postponed the 85th AGM, originally scheduled for November 20, and it would now be held here on December 17. The Supreme Court hearing on the same case is on November 24. New Delhi: India skipper MS Dhoni's stand that Gurunath Meiyappan was a “mere cricket enthusiast” supporting Chennai Super Kings has been contradicted by the Justice Mudgal IPL probe committee report. The report, which was partly made public yesterday, said that investigations have confirmed that Meiyappan was a team official. Dhoni, who had appeared before the committee, had maintained that Meiyappan, BCCI president-in-exile N Srinivasan's son-in-law, was not an official of the CSK. In its first report submitted to the Supreme Court, the Mudgal Committee had stated “representatives of India Cements, who appeared before the committee, contended that Meiyappan had no share holding in India Cements and hence cannot be considered as an owner of CSK. Carlsen, not known for preparation, again matched Anand move for move like in the last game and had nothing to worry about as the Indian's white pieces were neutralised move for move. The match seems to have tilted in favour of Carlsen post this game as Anand could not produce anything decisive in terms of opening preparation. As the game started it was clear that Carlsen was happy to get an equal position out of the opening. And while Anand spent too much time on the first few moves, it was clear that the task given to team Carlsen was performed pretty nicely. The Indian king tried but did not succeed in finding the path to execute some pressure on the Norwegian giant. The end result was a draw. For the record, Anand went for the principled variation in the Queens gambit declined but having his long term second and friend, Peter Heine Nielsen, on the other side did not help his cause. 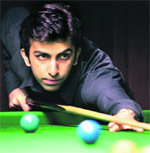 Anand did his best but it was not enough to force the result he would have wanted. After frustrating the Pakistani bowlers with his defiant unbeaten 32, Kiwi leg-spinner Ish Sodhi spun a ball past Shan Masood's (13) bat and hit the middle stump. Sodhi's spin partner Mark Craig then drew the other opener Taufeeeq Umar (16) out of his crease to get him stumped. Pakistan were 34 for two wickets at stumps, 369 runs behind their opponents with eight first innings wickets in hand. Younis Khan, who has hit three centuries and a double hundred in his last six Test innings, was batting on one with Azhar Ali (four) at the other end. Resuming on 243/3, New Zealand conceded the morning session to Pakistan, who claimed three wickets for 52 runs to peg back the Kiwis. The North Zone selection committee, headed by national selector Vikram Rathour, today decided to reward all those who have performed in the North Zone leg of Vijay Hazare Trophy. It has been learnt that Sehwag has told some of the top DDCA officials that he does not want to block the road of promising juniors from Delhi. There are enough indications that Sehwag and Gambhir are fully aware that there is very little chance for them to make it into the 30-member probables for the World Cup with all three current openers amongst runs and Murali Vijay — the fourth opener — as their cover. “The full force of the law must come down on Meiyyapan,” Gavaskar said in Melbourne. Gavaskar said Srinivasan needs to explain why he did not act against players if he knew they were involved in fixing. “There are reports which say the Mudgal Committee has found that Srinivasan knew about betting but did not do anything about it. Srinivasan should answer why he did not act if he knew that a player was guilty,” Gavaskar said. 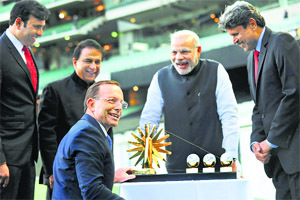 Gavaskar was in Australia at the invitation of Prime Minister Narendra Modi to attend a special reception at the Melbourne Cricket Ground, which was hosted by Australian PM Tony Abbot. Gavaskar said that there should be zero tolerance against match-fixing and betting. And if any player, he said, is found guilty of having participated in wrong acts then he should be jailed and his entire cricketing history deleted from the record books. Gavaskar said, “New Zealand has come up with a new law on betting which says that guilty players will be jailed. India should have the same law.” The former captain also suggested that the government should think about legalising betting in India. In a format where the final result is decided on the basis of aggregate score of the five-match tie, Pune bagged 26 points while Hyderabad obtained 25. The highlight of the day was the singles clash between Hyderabad’s Martina Hingis and Pune’s Radwanska. In a keen battle, the two star players regaled the spectators with their powerful shots and long rallies. The young Polish player grabbed an early 3-0 lead but Hingis fought back to make the score 4-2 as the strong Hyderabad crowd cheered her on. The agile Radwanska, however, managed to maintain her lead and finally won 6-3. Former Australian player Mark Phillippoussis gave an early lead to Hyderabad with a 6-3 win over compatriot Pat Cash, 49, in the Legends category. The organisers of the league believe there is a huge market for tennis and they have a reason to believe so — India has long been deprived of top-tier tennis action, barring only one ATP 250 tournament in Chennai, with two or three big names participating in the event. The CTL has a host of current and retired superstars, and an essential mix of business and cinema world to lend glamour and money, and most importantly, grab the attention of country’s youth. However, a look at the Delhi leg of the CTL and the first thing that strikes you is that it’s a haphazardly organised tournament. The likes of Jankovic or Ferroro playing in front of a nearly empty stand at the RK Khanna stadium does not inspire much confidence in the league, with the claim of the match being “sold out” by ticketing partners falling flat. Equally surprising is the timing of the matches, with an 8pm start hardly making Delhiites step out of their comfort zone. The players involving in friendly banter and absence of long deuce games and endless baseline rallies, the tournament lacks any competitive edge. Even the Indian players on display on Tuesday — Sanam Singh and Sriram Balaji — did not seem eager to learn from the past and the present masters of the game. As has been the case with other leagues in the country, the organisers struggled to recover the operating costs on each occasion, but the organisers of the CTL are optimistic as of now. Garcia struck in the 51st minute, beating the towering Spanish World Cup winner Joan Capdevilla in the middle. 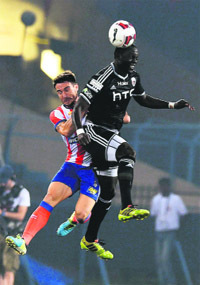 The win helped ATK go three points clear of Chennaiyin FC in the lead position. It was Borja Fernandez who brilliantly intercepted the ball and passed it on to Jofre Mateu whose measured cross from the left set up Garcia for the matchwinner. Atletico now have 16 points from nine matches. The scoreline could easily have been 2-0 but substitute Arnal Llibert squandered an easy opportunity after being set up by Sanju Pradhan in front of an open net. If NEUFC were brilliant with their defence, they were equally pathetic with their attack with the Indian duo of Durga Boro and Alen Deory wasting chances which derailed their recovery plans. The highlight of his career has been a record opening-wicket partnership of 587 runs against Amritsar in ML Markan Trophy in April 2014. He along with Nirmal Singh created a world record in age group cricket with their feat. Captaining the Mohali side, Shubham reached his triple century in just 272 balls, studded with 49 boundaries and 2 sixes and scored 356. Currently he is representing Punjab in an U-19 tournament in Madurai. An ecstatic Shubhman called up his parents back home after hearing the good news. “I am eagerly awaiting for the award ceremony in Mumbai and meet the big names of Indian cricket,” he said. All credit to Shubhman’s father that he identified his son’s interest and backed his talent. Lakhwinder erected makeshift nets for his son to hone his cricketing skills but soon realized that his son would not get anywhere practising here in hinterland. “We realized that we had to send him to Mohali for better facilities. So we admitted him at Manav Mangal School, Mohali, where he could train with good coaches at PCA,” he said. Since 2007, the hardworking son has been working tirelessly to prove his father right. On Tuesday, mother Kirat Gill is happy for her son and ready to forget all the sacrifices she made by keeping her son away from her. Overlooked for the 2017 championships in favour of London, the Qatari capital was selected ahead of rival bids from 1992 Olympic hosts Barcelona and the American city of Eugene, often referred to as Track Town. Indians open well at women's World Boxing: India enjoyed an all-win day at the eighth World Women's Boxing Championships after Shamjetsabam Sarjubala (48kg) and Maisnam Meena Kumari (54kg) entered the second round of the mega event on Tuesday. Sarjubala, a former world youth champion, defeated Grazieli de Jesus Sousa of Brazil in her opening bout. Meena, on the other hand, got the better of Ethiopia's Gebremedihin Felekech Seifu in her first bout of the tournament. Three Indian boxers will be seen in action on Wednesday. Commonwealth Games bronze-medallist Pinki Rani (51kg) will fight it out against Russia's Saiana Sagataeva, Monica Saun (75kg) will be up against Li Qian of China, while Sweety (81kg) will square off against The Netherlands' Mavine Koelemeij.